Well, that whole orchid kick got a little away with me. I hadn’t really intended to turn it into four posts when I found the helleborine stalks in the woods. And I cut myself short: I’m sure I could have rambled for a week on the subject if I’d wanted to. But I’m moving on now, to other things I’ve seen recently. On the same outing as I found the helleborines, I came across this tree trunk that had been gnawed away at by something. As I was stepping back to take a photo, Raven came over to check it out. She’s never one to pass up a photo op, whether invited or not. It does give you a sense of scale (she’s a 45lb dog). The damage extended about two feet (60cm) up the tree. 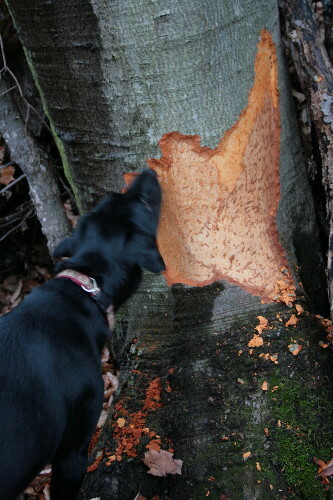 It’s the work of a porcupine, which switch to bark as a primary staple in the colder winter months, when there aren’t green foods available. The tree itself is a beech, so told by the smoothish gray bark, and it’s an oldish one. Judging from the diameter I’d guess it to be 60-80 years. It stands along an old fenceline, presumably the original fences from when the land used to be clear, and the forest has grown in around it again. I’ve noticed a few such trees in the forest. Damage like this on a smaller, younger tree might kill it, but this mature individual will likely just seal over the wound and keep on truckin’. Just like when you’re feeling stressed out, though, it will weaken the tree while it pulls through and make it more susceptible to diseases or other stressors such as caterpillar outbreaks. It’s interesting to note that there are two colours to the damaged area. The upper part, a small band across the top, is a lighter, brighter colour than the lower part. This suggests that the damage was done in two stages: the lower part was the porcupine’s first visit, and then it came back a day or two later, after the first part had already started to dry out, and chewed off a bit more. The porcupine would have chewed off the outer bark, which is tough and not very nutritionally useful, to get to the softer inner bark. The inner bark also contains some of the tree’s network of food transport tubes, called xylem and phloem, which like our veins move nutrients and oxygen throughout our body, contained within our blood. The outer bark acts like the tree’s skin, protecting the inner tissue. The damage exacted here by the porcupine is not dissimilar to if we fell and scraped our knee. The skin is peeled back to expose the soft tissue underneath, which then bleeds because the network of blood vessels has been torn. Before the tubes “clot” shut, some sap is lost, making the wound feel tacky, just like a scraped knee would be as it clots. 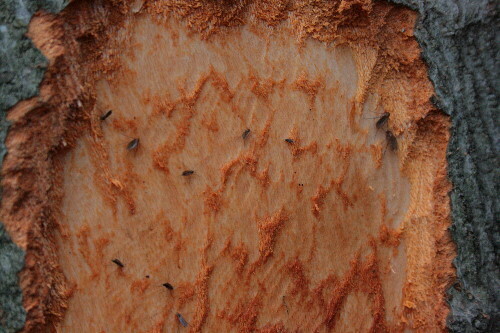 It was a moderately warm day out, by mid-November standards, and a few flies had been attracted to the sweet sap on the recently-damaged part. Thanks, Cindy. It’s funny how secretive they can be. I rarely see live animals, either, but as you say, their sign is very distinctive and often eye-catching. Good find. The patterns in the second image are especially intriguing: the chew marks, the tissue bruising, the scale of the bark before it reaches the wood at the heart of the tree. Thanks, Jason. It’s too bad those patterns are so tricky to capture adequately in photos.